Wisconsin Supreme Court rules in favor of paint company in a lead paint case involving a Milwaukee child who got sick after eating some paint chips. The Supreme Court&apos;s decision is very simple, according to an attorney for the Sherwin-Williams Company. Charles “Chuck” Moellenberg, Jr. explains, the high court ruled that white lead carbonate pigment is not defectively designed simply because it contains lead. Moellenberg says if lead were taken out, it would be an entirely different product. Its very presence is a characteristic of the product itself. In addition, he says well-maintained, intact lead paint is not a health risk to children. 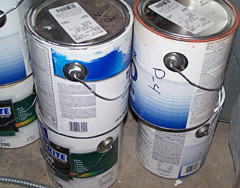 There are other liability claims that could be brought against the paint companies. Moellenberg says claims such as failure to warn consumers of the risk, would be difficult to prove, considering the toxicity of lead has been known for a very long time, and there have been warning labels on paint cans since 1955. The court ruled 6-0 in a case that began in January of 2006.